Some parties separate the practice of counselling from psychotherapy, distinguishing the latter as vastly superior to the former by nature of the duration of therapy, the issues engaged in and the level of therapist training. However the Irish Association for Counselling and Psychotherapy (IACP) does not differentiate between counselling and psychotherapy and for the purposes of clarity and simplicity both terms are used interchangeably within this website. It should also be noted that I am trained and fully qualified in both counselling and psychotherapy. Attending Counselling or Psychotherapy is sometimes misunderstood as going along to have something done to you but nothing could be further from the truth! Research from every popular therapeutic orientation outlines a successful working alliance between client and therapist as the greatest single factor promoting positive change for the individual. While there are many different counselling and psychotherapy orientations, Cognitive Behavioural Therapy (CBT) proposes that the interrelationship between our thoughts, emotions and behaviours dictates how well we can feel physically within our bodies. Underpinning the cognitive model are global core beliefs developed mostly from childhood experiences, determining perceptions of ourselves, the future, and the world around us (Beck’s cognitive triad). Our core beliefs underlie the attitudes, rules and assumptions of our intermediary beliefs, and our top level situation-specific automatic thoughts which ultimately dictate our emotional, behavioural and physiological responses in any given environment (Mansell & Taylor 2012, pp. 11-12). These systems interact not only with each other but with social, familial, cultural and economic environments as is evident in the so called hot cross bun as seen in the lower half of the generic problem development model in Figure 1 (Westbrook et al., 2013, p.13). The same problematic patterns tend to manifest in the same environments, giving rise to familiar but unwanted feelings of distress, fear, anxiety, panic, anger, depression and negativity. CBT can enable a person to gain awareness over the nature and sequence of these patterns allowing them to strategise and actively reclaim control of what they are in control of, whilst letting go of what they no longer or perhaps never needed to be in control of! 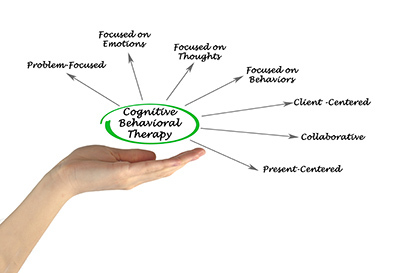 I describe myself as employing an integrative-cbt approach. This means that whilst holding particular preference for scientific and evidence based cognitive behavioural therapy methodologies, I believe the therapeutic benefits available to clients can sometimes be enhanced by integrating CBT with timely and appropriate elements from a range of other orientations. This holistic and integrative approach works by treating the whole person not just a specific presenting problem. Beyond their basic structure, your sessions are very much about the two of us working together on agendas that you set for yourself. Therapy really is one of those processes where the rewards and benefits available to your life are largely dependent on your commitment and input. The work undertaken within sessions sets the ball rolling for gradual changes in perspective and action in the outside world. An initial brief telephone conversation is standard to determine if therapy is appropriate for clients before scheduling an appointment. Sessions are approximately 50-55 minutes in duration. Clients set the agenda for what we can work upon together but it is not my role to offer advice and nor will I endeavour to do so. Optimal therapeutic benefits are more accessible for those clients attending a weekly set appointment time. The fee is €60 per session with a full schedule of fees visible in the FAQs. Fees are the same for all sessions, including the first. A 48 hour cancellation policy applies whereby 50% of the appointment fee becomes payable by the client if they cancel their session within 2 days of their agreed appointment time, or if they fail to attend. Clients usually to commit to a minimum of six counselling sessions, although many clients choose to work with me over a far greater period of time.